City Farming is an innovative technology that deals with organic farming in urban areas and essentially on terraces. Collection and disposal of organic wast is the prime and legal responsibility of the municipal authorities. Mumbai Municipal Corporation spends about Rs.450 crores per annum on solid waste management and, even then, organic waste causes various problems including health hazards. 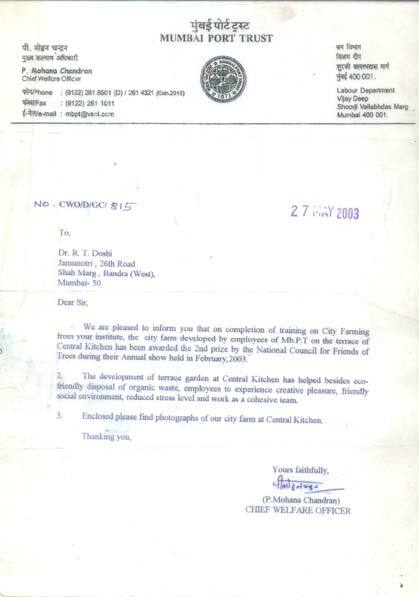 It is Dr. R T Doshi, a strong believer in the Gandhian principle of self-help, who patented a process and technology to Dispose of the organic waste generated in the household premises without causing any health hazards and simultaneously using this organic waste for agricultural production for human consumption. All this without much effort and minimum cost.